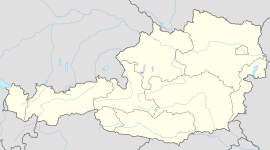 Wiener Neustadt (German pronunciation: [ˈviːnɐ ˈnɔʏʃtat], Vienna New Town) is a city located south of Vienna, in the state of Lower Austria, in north-east Austria. It is a self-governed city and the seat of the district administration of Wiener Neustadt-Land. The city is the site of the world's first military academy; the Theresian Military Academy was established by Empress Maria Theresa of Austria in 1752 to train officers for the Austrian army. The area once belonged to the County of Pitten, which had been inherited by Margrave Ottokar III of Styria in 1158. After the dynasty of the Otakars became extinct with the death of his son Ottokar IV, the Duchy of Styria passed to the Austrian House of Babenberg according to the Georgenberg Pact. Duke Leopold V of Austria established the town in 1194 and financed the construction of a fortress close to the Hungarian border with the ransom paid for the English king Richard the Lionheart, whom he had previously captured and held as a hostage at Dürnstein Castle. In 1241, a small Mongol squadron raided Neustadt during the Mongol invasion of Europe. Wiener Neustadt, meaning more or less New Vienna ("Viennese Newtown"), gained important privileges given to the city in order to enable it to prosper. It remained a part of Styria, which after the 1278 Battle on the Marchfeld fell to the House of Habsburg and in 1379 became a constituent duchy of Inner Austria. In the 15th century, Wiener Neustadt experienced a population boom, when Emperor Frederick III of Habsburg took up a residence here and established the Diocese of Wiener Neustadt in 1469. His wife, Eleanor of Portugal, died in Wiener Neustadt in 1467. The Wappenwand (coat-of-arms wall) at the local castle displays the coats of arms of his possessions in the middle. His son Maximilian I maintained his court in Wiener Neustadt and is buried here at St. George's Cathedral. The town then also had a significant Jewish commune with Rabbi Israel Isserlin as its most notable member, until all Jews were expelled by order of Emperor Maximilian I in 1496. Habsburg's long-time rival King Matthias Corvinus of Hungary conquered the city in August 1487 after having laid siege to it for two years. According to legend he dedicated the magnificent Corvinus Cup to the inhabitants after his victory. Maximilian I managed to reconquer his native city in 1490. During the 16th century, Wiener Neustadt lost its status as imperial residence and much of its importance. However, it still fulfilled its function as bulwark against the Turks and the Kuruc. Herzog-Leopold Street at Hauptplatz square. In 1751 the city received greater attention when Empress Maria Theresa of Austria decided to dedicate the First Military Academy, worldwide, inside the imperial castle. In 1752, the Theresian Military Academy took up its operations, which have continued to this day with only a few interruptions (Erwin Rommel was appointed commandant after the Austrian Anschluss in 1938). In 1768, Wiener Neustadt was destroyed by an earthquake that damaged the castle, which was rebuilt using plans made by the architect Nicolò Pacassi. In 1785, Emperor Joseph II of Habsburg transferred the see of the Wiener Neustadt diocese to Sankt Pölten. In the 19th century the city became an industrial town, especially after the opening of the Austrian Southern Railway in 1841. In 1909, the "first official Austrian airfield" was inaugurated north of the city. It later served as a training ground for the flight pioneers Igo Etrich, Karl Illner and Adolf Warchalowski, who conducted their tests there. The average monthly temperatures are generally cool (see table below), with summer months reaching 21–26 °C (70–79 °F) and winter months reaching a few degrees above freezing in the daytime. The Late-Romanesque Dom, consecrated in 1279 and cathedral from 1469 to 1785. The choir and transept, in Gothic style, are from the 14th century. In the late 15th century 12 statues of the Apostles were added in the apse, while the bust of Cardinal Melchior Klesl is attributed to Gian Lorenzo Bernini. Former church of St. Peter an der Sperr, erected in the 13th century and modified in the mid-15th century by the imperial architect Peter von Pusica. Secularized in the 19th century, it is now used for exhibitions. The Theresian Military Academy, a 13th-century formerly four-towered castle which was later used as residence by Frederick III of Habsburg. The latter had it enlarged and the St. George Chapel built in the mid-15th century: it has notable glassworks and houses the tomb of Emperor Maximilian I. It became seat of the Academy in 1752. Destroyed during World War II, it has been rebuilt to the original appearance. Tower of Tortures (early 13th century), now housing a private weapons collection. Church of the Capuchins, documented from the 13th century. Of the original construction today the Gothic choir (late 14th century) and the statues of St. Mary and St. James can be seen. The medieval walls, built using part of the ransom of Richard I of England. Wiener Neustadt Hauptbahnhof (German: main station) connects Wiener Neustadt with other major population centers. It is owned and operated by the Austrian Federal Railway. Wiener Neustadt is also served by Autobahn. The city has two airfields (a military one which was the first airfield in Austria and a civil one owned by Diamond Aircraft) and is the starting point of Austria's only shipping canal, the Wiener Neustaedter Kanal, which was meant to reach out to Trieste but was never finished. Austria's first and largest Fachhochschule for business and engineering, the University of Applied Sciences Wiener Neustadt, is located here. The most recent extension of the city is the Civitas Nova, Latin for new city, an ambitious project for an industrial, research and commercial center. In 2008, on the area of the Civitas Nova, a cancer research center for ion therapy will be opened under the name of Med Austron (link in German). In 1996 Wiener Neustadt became internationally famous as a so-called "sidewalk" designed by Japanese artist Tadashi Kawamata was built around the main square. In 1995 Wiener Neustadt was the host of 1995 Speedway Grand Prix of Austria. It was the first, and so far, only Austrian SGP. See also: Category:People from Wiener Neustadt. Irfan Skiljan, computer programmer and creator of IrfanView now working in Wiener Neustadt. Viktor Gernot, actor and comedian. Wiener Neustadt is the setting for the book Reluctant Return: A Survivor's Journey to an Austrian town. ^ "Cradle of the Austrian aviation". Wiener Neustadt history. stadtmuseum.wm.at. http://translate.google.com/translate?u=http%3A%2F%2Fwww.stadtmuseum.wrn.at%2Fgeschichte%2Fgeschichte.asp%3FID%3D39&sl=de&tl=en&hl=en&ie=UTF-8. Retrieved 2009-09-15. ^ Wernfried, Haberfellner; Schroeder Walter. Wiener Neustädter Flugzeugwerke. Entstehung, Aufbau und Niedergang eines Flugzeugwerkes. Weishaupt Verlag, Graz. ISBN 3-7059-0000-5. Wikisource has the text of the 1911 Encyclopædia Britannica article Wiener-Neustadt. This page uses content from the English language Wikipedia. The original content was at Wiener Neustadt. The list of authors can be seen in the page history. As with this Familypedia wiki, the content of Wikipedia is available under the Creative Commons License.